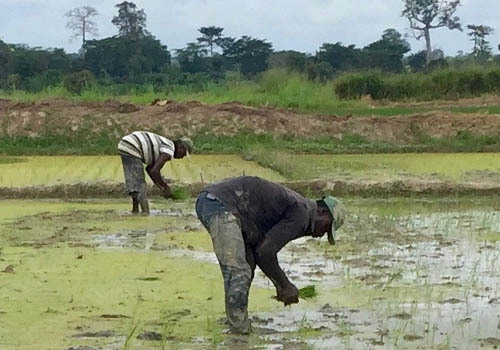 To inform the landscaping study for the Regional Index for Western Africa, the Access to Seeds Index team visited a rice seed and plantain propagation material producer in Côte d’Ivoire. Rice is the major staple crop in Côte d’Ivoire. Farmers generally renew their seeds every three seasons. SPY produces OPV rice seed varieties, using AfricaRice foundation seed. Government inspectors visit the fields three times during the production. Directeur Général Rou KouTou Assémien showed us around. See photo report on Facebook. Plantain is the third major crop in Côte d’Ivoire, after rice and manioc (cassave). Plantains are vegetatively propagated. Farmers generally plant new trees every four to five seasons. Directeur Général of SPY showed how new plants are produced.